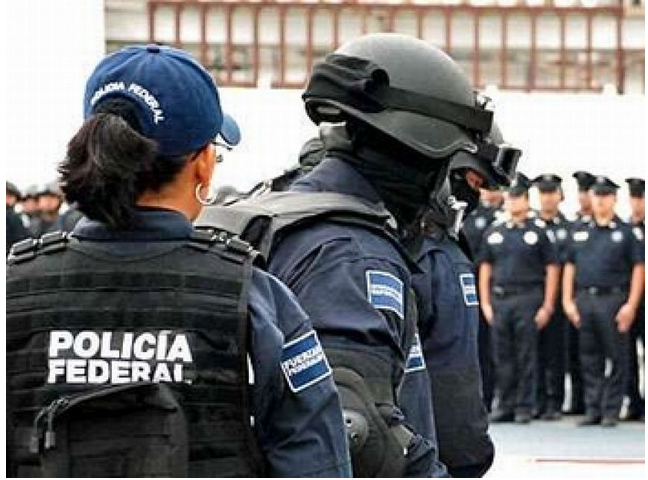 Mexican authorities reported Tuesday that they had arrested 13 federal police officers who allegedly belonged to a murder and kidnapping gang in the Pacific coast resort of Acapulco. 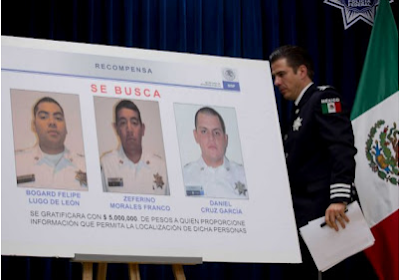 The operation was one of the largest against corrupt police officers in Mexico in recent years. 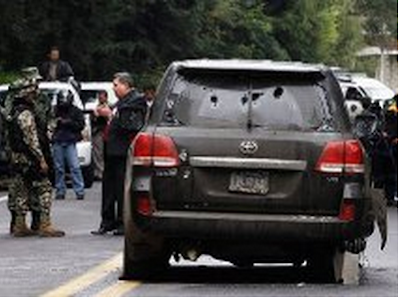 The federal security spokesman Eduardo Sánchez said, "The 13 officers and 5 civilians are linked to at least seven homicides and four kidnappings, in which two of the victims were killed in a cowardly way"
The Federal Police (PF) conducted a "thorough investigation" that led this week to the arrest of 18 criminals, including 13 active agents in the southern state of Guerrero, where Acapulco is located. These people, including a woman, are "linked to at least seven murders and four kidnappings," the official said, adding that those arrested are also allegedly responsible for drug trafficking and organized crime. He noted that they are currently investigating the world of the gang members, headed by a civilian identified as Luis Miguel Gonzalez, to determine if there is more involved. In the case of the federal police, Sanchez said he may face a penalty of up to 70 years imprisonment for each of the kidnapping, in addition to those received by other crimes, and said that "there will be no mercy" to them. These agents were sent to the southern Mexican state operating under the program Safe Guerrero, designed by the Federal Government in October 2011, to combat criminal groups and stop the wave of kidnappings, extortion, and drug related shootings in that region. "Under no circumstances will we tolerate impunity and corruption by any public servant," said Eduardo Sánchez, Secretary of the Interior, who lamented that police officers who are entrusted will violate the law are committing "acts of treason." So far the administration of Enrique Peña Nieto, who started last December 1, have been 94 federal police officers jailed , including the 13 officers arrested in Guerrero, but they've dismissed "many more," said National Security Commissioner Manuel Mondragón. Speaking to Milenio Television, PF chief said the 13 policemen were already incarcerated in high security prisons in the north of the country and reiterated their commitment to "zero tolerance" to corruption. The detained civilians: Luis Miguel González Petatán, 31, the presumed leader of the criminal group; Jonathan Piedra Soberanis, 24; Gerardo Ocampo Guzmán, 32; Roberto Bolaños Manríquez,35 años, and Paloma Rosa Iris Carrillo Abarca, 31. 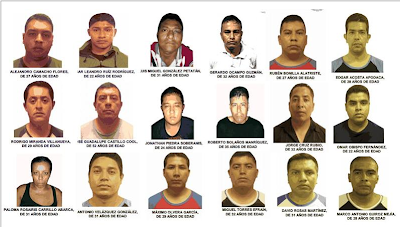 The federal police officers are identified: police thirds Antonio Velázquez González 31; Máximo Olvera García, 29; Rubén Bonilla Alatriste, 27; Miguel Torres Efraín, 32; Jorge Cruz Rubio, 32; Édgar Acosta Apodaca,28; Omar Obispo Fernández, 22; Marco Antonio Quiroz Mejía, 28; David Rosas Martínez, 31; Alejandro Camacho Flores, 27; César Leandro Ruiz Rodríguez, 22; the police first (level), Rodrigo Miranda Villanueva, 29 años, and the official José Guadalupe Castillo Cool, 52. "We will not give an inch" and "continue cleaning our house" until we're up to "100% respectability. " in the PF, who Mondragon admitted , "there is much to do yet," including a rethinking of exams, trust and control issues..."
The Federal Police, created during the administration of Felipe Calderón (2006-2012), has been involved in several corruption scandals involving abuse of authority. 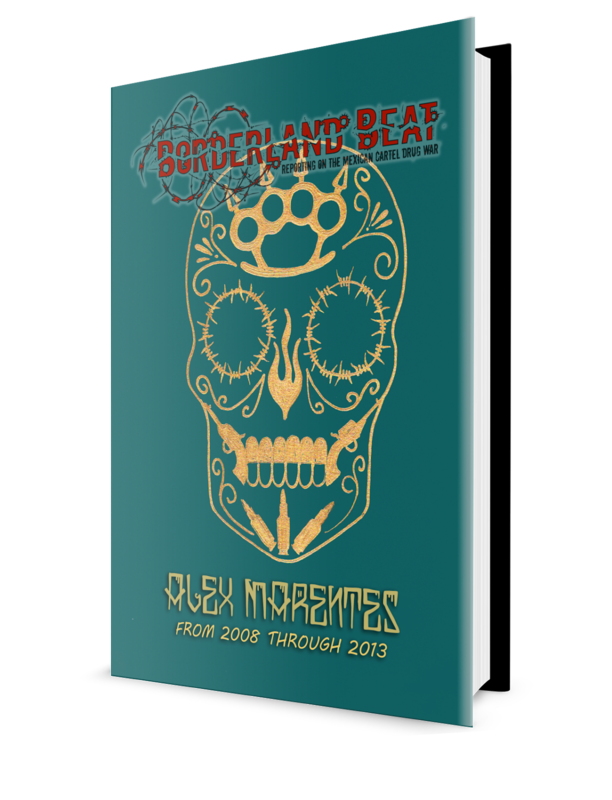 Among the scandals even in Calderón's term are two memorable cases, one being the twelve agents involved in the August 2012 attack on a SUV traveling with two U.S. Embassy officials and a member of the Mexico Marines in the central state of Morelos. And the other notable PF scandal happened just a few weeks earlier, in late June 2012. It involved the unforgettable shootout at the international airport terminal in Mexico City that killed three federal agents and uncovered an embarrassing web of corruption and drug trafficking in which several members of the PF were Fighting over the Loot. 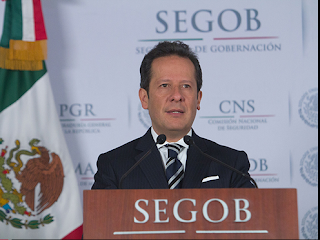 This Federal police kidnapping case is the most serious since Mondragon, recruited by Peña Nieto, took the reins of the National Security after reaching the top of the Ministry of Security in the Mexican capital. In the October 10, online edition of of Excelsior, the Citizen Council for Public Safety and Criminal Justice, said the number of kidnappings in Mexico "has exploded," despite the commitment that President Enrique Pena Nieto did as a candidate I was planning to halve. So far during the administration of President Peña, the incidence of kidnappings and extortion, rather than go down or at least maintain their level has skyrocketed, "said the president of the organization, José Antonio Ortega. If you add up the figures of the National Public Security System (SNSP), those of kidnappings reported to the attorney general and the victims rescued by the Army and Navy, 2013 could end with more than 3,600 cases , compared to 3,259 in 2012, said. Figures released earlier this month by The National Statistic Institute and The latest public security report said there were 105, 682 kidnappings in Mexico in 2012 of which an incredibly small 1,317 were reported to local or federal authorities. In other words, 99% of all kidnappings in Mexico flew under the radar last year and 92 percent of all crimes that occur in the country are not reported to the police. 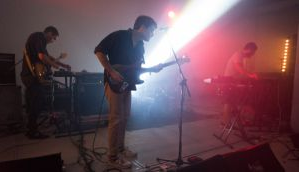 On Monday October 7, 2013 the Basque band, Delorean, from Spain suffered a virtual kidnapping or express kidnapping while they were touring in Mexico in support of their newest record entitled Apar. 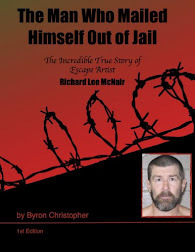 The band was subjected to 30 hours of psychological manipulation, intimidation and extortion. Spanish National Police, Ertzaintza (Basque police), Interpol and the Federal Police in Mexico worked quickly in rectifying the situation. 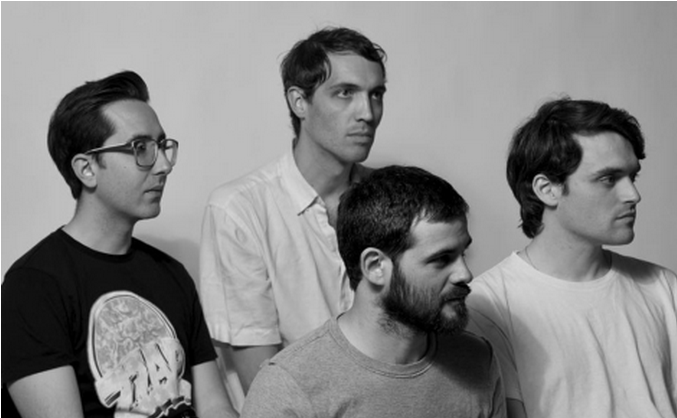 The band had nothing but praise for the Federal Police but they packed it in, cancelled their tour and went home following the ordeal. A week before another Spanish national endured a virtual kidnapping. A Catalan business suffered a express kidnapping in the city of Queretaro, Mexico. 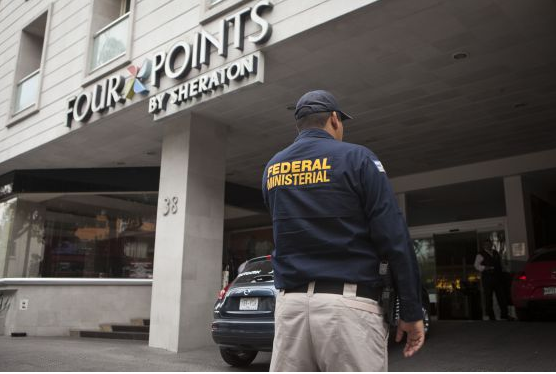 The Spanish business man was threatened by people posing as members of Los Zetas who demanded a million pesos (60,000 euros) from a relative and forced the Spaniard to stay in the hotel until the ransom was received. Mexico’s local police are famously negligent when it comes to identifying, pursuing and reporting crimes. A study in 2011 found that Mexican police investigated a mere 4.5% of crimes. Even when detained, criminals are rarely convicted because of the country’s broken justice system—one which the US has been trying (and failing) to help Mexico with for years. Only 31% of those arrested on drug charges between 2006 and 2011 were actually convicted, according to a report released by Mexico’s attorney general’s office last year. In a scandalous article in ZETA translated by un Vato for Borderland Beat, regarding slain cartel-fighting police chiefs whose deaths never were investigated, it was noted that the Prosecutors, complicit with drug traffickers, decided to not investigate, allowing the assassins and their bosses to go unpunished. It did not matter that the criminals tried to kill authority figures nor that they attacked the government. If the Public Ministry did decide to initiate an investigation, it was against the victims, for using weapons "excessively" to defend their lives. 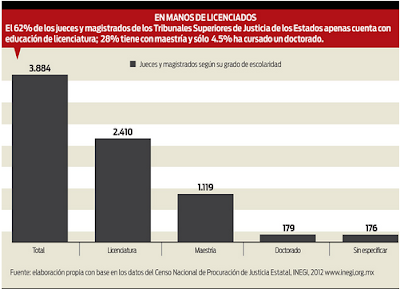 The system of administration and enforcement of justice in Mexico is deeply questioned. Very few people rely on the ability and ethics of conduct of the police, the public prosecutors and judges, and within the three areas, public safety, law enforcement and the administration of justice face perception of citizen pointing to inefficiency and corruption. Certainly, the construction of a democratic welfare state requires a legitimate authority in the eyes of the public, because otherwise it is very difficult to build a framework of legitimacy in which everybody can recognize, without haggling, which is always preferable to obey the law. One of the key elements for the functioning democracy is in the confidence of the citizenry on public institutions. In our country, two-thirds of people over 18 years report some degree of suspicion and are extremely skeptical about institutional performance in the field of justice. 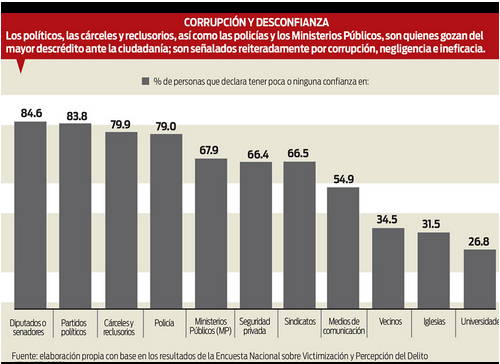 The results of the National Survey on Victimization and Perception of Public Safety, 2013, coordinated by the INEGI, shows that 65% of those 18 years or older believe that Prosecutors are corrupt and a similar figure considers the ministerial police also are. Also, 64% of the population believes that judges are consistently linked to corruption, which is extremely serious because if two out of three people are suspicious of the impartiality of the judges and then it can be argued that the conditions for building a genuine rule of law are involved. In the same vein, only 43% of citizens think Public Prosecutors are effective in their work, 44% think that ministerial police are performing, and only 49.4% of the population assumed that judges have performed well in their responsibilities. The weakness in the chain of procurement and delivery of justice in Mexico starts from the integration of the preliminary investigation. First it should be noted that according to the National Crime Victimization Survey and perception of Public Safety 2012, of all crimes committed in 91% of cases does not start with an inquiry investigation by the ministerial authorities. The first survey in the Federal Centers for Social Rehabilitation 2012, coordinated by Elena Azaola and Catalina Perez-Correa, notes that of all persons detained in prisons in Mexico, 53.7% said they were taken first to "another place" before being made available to the Public Ministry (MP), as it stated in the Constitution. Additionally, of those who did were made available to the MP, 30% said they spent between one and three hours before being brought to the MP one of five states that spent between 4 and 8 hours before being submitted to the authority; 12% said they spent between 9 and 12 hours, 13.5% indicated a span of time between 13 and 24 hours, while 17% say that the police or other authorities held them between one and four days. The Azaola and Perez-Correa study shows that of the total of persons detained in federal prisons, 38.2% are young people between the ages of 31 and 40 years, 27.3% are located in the group between 41 to 50 years, one of four, that is, 25% is between 21 and 30 years and the rest, equal to 9%, is 51 or more years old. Also, 80% of those in federal prisons have children, note that over 65% of women had their first child before the age of 19 years old. It should also be mentioned that almost 18% of those who are detained have had a brother or sister in prison, 11% said that some guy has been (? ), while 9% said that at least one cousin has been before or stopped. Additionally, it should be noted that 53.7% of those detained in federal prison lack completed basic education studies, 20.4% completed high school studied, 12% have incomplete school, 7.3% completed high school attended, 4.3% attended college so truncated, while only 2% completed a college or graduate education has. As noted and shown above, Mexico has an extremely weak prison system, both in regards to capacity, and as to the quality of provided services, treatment of persons in custody, and the performance of those responsible for conducting custody and operation thereof. According to the survey cited, in Mexico there are 418 prisons: 306 are by various states, 90 are attached to the municipal authority, while 12 are the responsibility of the Federation, and one is in the Federal District. According to this study, as of January 2012, the total prison population was 233, 000,277 inmates, of whom 95% were male and only 5% were women. The Constitution of the United Mexican States establishes as a basic principle for the administration and enforcement of justice, the principle of the presumption of innocence, that is, no one can be treated as if guilty until he is proven so by authority. On this subject it should be noted first, that a huge number of people are in prison without yet having receive a conviction from the judicial authority.Indeed, the study said, only 59% of those in prison for a state crime has been sentenced. At the federal level, the issue is even worse, as 53.3% of those in prison have received a conviction; This means that 53.3% are kept as "processed," which, in absolute terms, means that, of the 48,066 inmates accounted for in the year 2012, a total of 25,619 were in jail without having received yet a conviction. The study shows that the vast majority of those detained were arrested which is a flagrant, unequivocal indication that the Mexican criminal justice system lacks an adequate criminal investigation system, which is the responsibility of the Public Prosecutor and the judicial police investigation. According to the study Azaola and Perez-Correa, only 48.3% of those who pleaded guilty admit to having committed a crime, 30.5% said they pleaded guilty because they were t tortured, 24.5% did so because they were pressured or threatened to do so; 4.7% did so because the public prosecutor told them "it was the best", while 4.4% plead guilty because their family threatened. Also, according to the National Census of State Justice Administration, only 24 states have "Internal Control Office" judiciaries verifying all procedures, there are only 23 penalty schematics for public servants, and there are only 17 investigation schemes against public servants. Thanks to DD in the forum for the Quartz article with kidnapping statistics etc. for part of the kidnapping portion of this post. Shameful, despicable, embarrassing, greedy. What more is there to say but they have to do a while lit better dealing with kidnapping. All kidnapping including express kidnapping makes Mexico look terrible too. In the u.s its mostly young ppl committing the crimes also so alot of states have changed the juvenile laws.on violent crimes kids as young as 13 are tried as adults and should be.if theyre old enough to pull the trigger they old enough to do the adult time in prison and in some cases and states they never get out!! Mexico should change their juvenile justice laws!! At some point, the Mexican populace will reach the tipping point because of the systemic corruption and denial of justice. Once the critical mass is reached, revolt will be widespread. Nonsense. That time has come and gone. The people are weak. It stands to reason that governments infiltrated won't investigate killed honest police chiefs. The Pf look like flailing corruptos that they may never be able to get 60 or 70 % clean, no matter how hard they may be to the csuse of "house cleaning." The govt should be ashamed of hiring these thugs,they should line them up and finish them off with a firing squad. Even that is not harsh enough. Buen trabajo mexico. Agarren a todos los corruptos traidores de la patria. Bastards should be burned alive in public and made an example. All who have no respect for life should be publicly executed. Cartels extortionist kidnappers look outs corrupt political leaders judges police. All who have brought pain and suffering of to the people of Mexico. Return the death penalty and broadcast all executions on the television. 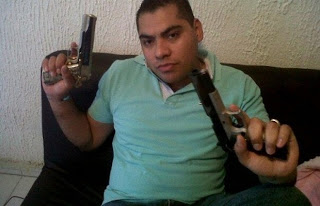 This post has some pretty good links from un vato's coverage of that wacky shootout at the airport. The juvenile law in Mexico is embarrassing!! If you are under the age of 18 and commit multiple crimes you can be free by the age of 18 !! It's like they automatically erase ur criminal record...this is cartels seek young children cause they won't be incarcerated for long.. Seriously, Mexico. You really need a death penalty. With an express lane. Yeah, seriously Mexico, you are beginning to annoy your own people with your total lameness. For some it is DISGUST and a total loss of respect, patience with my country. This post shows a country with a misplaced or abandoned judicial system which leaves Mexico in the shape that it is in - a hopeless, disfunctional state of chaos where some states are run by corrupt greedy, violent, narcos who won't stop at anything to get richer off of selling drugs. What a mess. And they have to really want it to change and many really must not. So you can't readily force change, right? Sickening! In the U.S.A., to become a federal police of any agency, except border patrol or customs - you need h.s. diploma only, you need to have a bachelor degree to qualify. Your talking about at least 4 more yrs. education on top of h.s. Not just anybody can decide they want to become a federal police agent. I don't think that's the case when it comes to their federal police in Mexico. Probably the pay is not that good either. This Manuel Mondragon y Kalb is in interesting individual. He's been abureacrat in the Mexican govt. since the 70's. It is my understanding he helped train in Karate and torture tactics a lot of the Federal police that were in the old Direccion Federal de Seguridad, the federal intelligence agency of the 80's, many of whom became corrupt and started working for the cartels, one of the cartels included was the one headed by Rafael Caro Quintero. Some of these federal police carried the kidnapping and murder of DEA agent Kiki Camarena. Kidnapping foreigners is going to do nothing good Mexico's tourism industry. 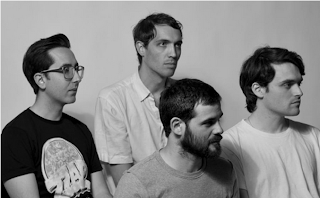 Bands won't tour in Mexico either. Everybody loses except the greedy punk losers who have to live with their creepy decisions. Respect your country! Don't add to the degradation just cause others do. Be different-don't be dictated. Quit ruining Mexico! No mamen! No tienen facha de federales! Many ex-convicts, AND current prisoners in jail do work as police officers AND SICARIOS,all at the same time!! !